The “Green Iguana” was built in 2003. 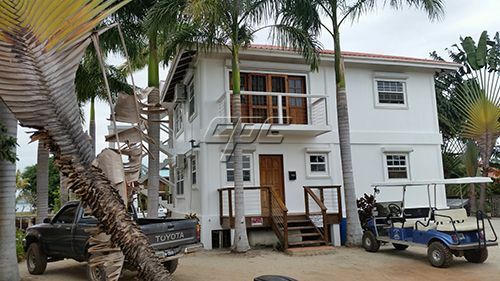 Concrete construction with electric and manual hurricane shutters that is extremely sturdy and has been built to withstand the rowdiest storm. The house is separated into two apartments, one upstairs and the other downstairs. 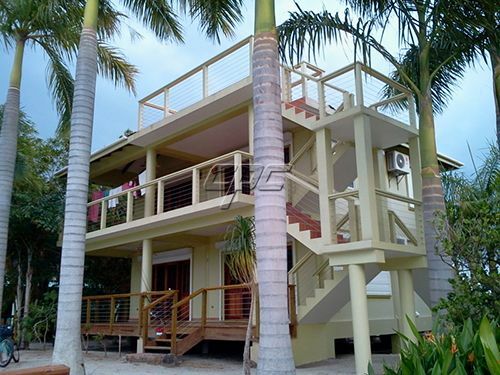 An exterior stairway leads to the top of the house and a sun deck at the very top to see the sunset. The house, including both floors, is to be sold furnished with all major appliances and furniture. Plentiful windows on all sides of the house can be opened to let the breeze blow through. A propane gas tank fuels both cooking ranges and an instant-on hot water heater. All of the floors are quarry tile, which you’ll find is quite beautiful and very easy to care for. Both apartments are air-conditioned and have ceiling fans in every room. There is one utility room, located downstairs, that houses the gas hot water heater, the washer and dryer, a big deep utility sink, a lockup closet and some handy storage shelves. 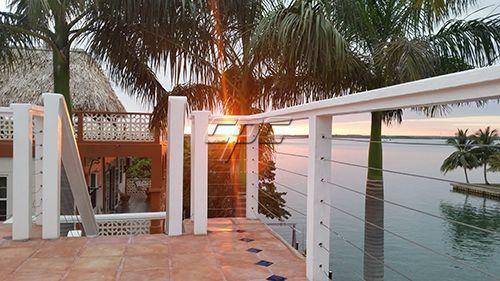 The apartment upstairs features a living room, kitchen, two bedrooms and one bathroom, as well as a large balcony facing the the harbor and a smaller balcony off the back bedroom with beautiful views of Placencia Point. The spacious living room opens to the kitchen area. A counter, with a tall bar on one side and four armed swivel barstools, separates the two areas. The lovely kitchen cabinets are made from beautiful mahogany and the countertops are made from travertine stone. The upstairs apartment master bedroom has a queen size captains bed (which has spacious drawers and a lengthy storage area), a beautiful armoire and a small cabinet. The second bedroom has two twin captain beds with drawers underneath, an armoire and a small cabinet. The bathroom has a large, walk-in shower made from travertine. The interior walls are over eight feet tall. The house was built like this for ventilation and you’ll be comfortable without using the air conditioning most of the time. The apartment downstairs has a living room that opens to a kitchen with a layout different from the upstairs apartment, with a small kitchen island and regular sized chairs. There is one bedroom with a king size bed that can be converted into two twins. The bedroom has a beautiful built-in armoire, too. As with the upstairs apartment, the downstairs apartment bathroom has a travertine walk-in shower. 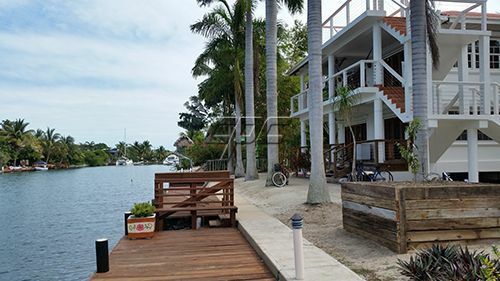 “The Green Iguana” has a 75 ft. wooden dock, with easy tie up for a boat. We’ve caught our dinner there many times! 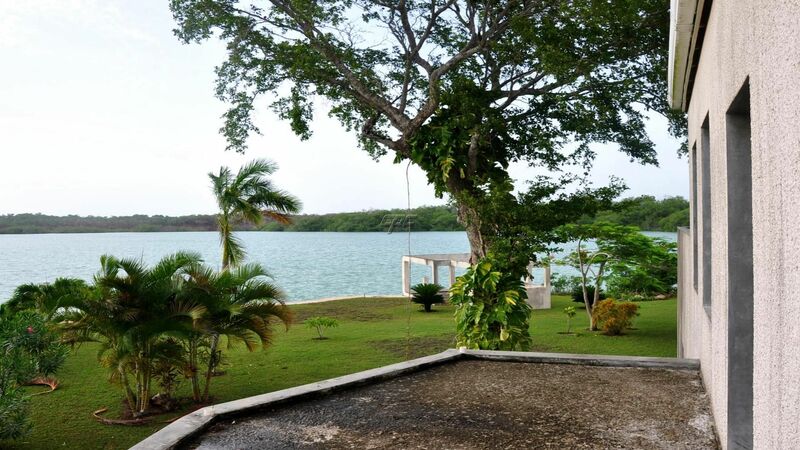 It also has a fish cleaning station and easy-access steps to the water, when swimming. And when you want to go to the beach, it’s just a ten-minute walk to get there. 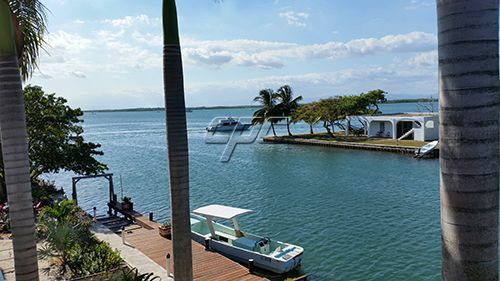 One of the best amenities of Placencia is the water! It is piped across the bay from Independence. An American company dug the well years ago, for a factory they hoped to build. They changed their plans and gave the well to the community. People from all over rave about the good tasting water! 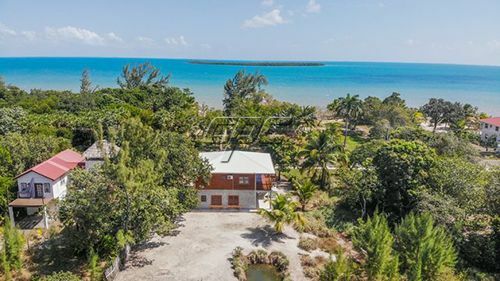 The Lot “The Green Iguana” was built on is 75 ft. x 96 ft. It looks bigger because the house is tall and the trees are taller. The landscape consists of coconuts, royal palms, travellers palms, bamboo and smaller tropical trees and shrubs. We love the white sand and prefer to keep our yard raked and looking good.